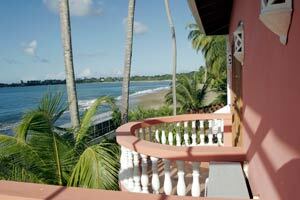 Mirage is the largest of 3 beach villas located on Turtle Beach. 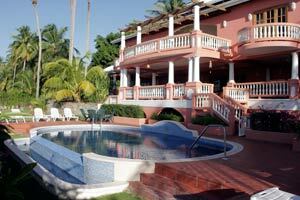 These luxury villas are the ideal solution for large families, and wedding parties. An entrance hall provides immediate access into the lounge/dining areas together with doors through to study, cloakroom, kitchen and 2 bedrooms. The bedrooms on the ground floor consist of one double and one twin; both with en-suite facilities; the twin bedroom en-suite is provided with a bath and shower over; and access onto the large veranda to the rear. The kitchen is fully equipped with oven, hob, toaster, microwave, fridge/freezer, blender, kettle coffee maker, cutlery, saucepans, plates, glassware etc. Stairs from the hall lead to the first floor landing where access is provided to 3 double bedrooms and a small study/sitting room area. All bedrooms are en-suite and the middle en-suite has a bathe with shower over. All bedrooms lead onto balcony areas with the largest being accessed from the middle bedroom/lounge which also has a TV. The large extensive ground floor balcony is accessed from the 2 ground floor bedrooms, kitchen, lounge and study area. It is fully furnished for seating and eating arrangements. Steps lead down to the garden area where there is a large swimming pool, external shower & foot bath, purpose built BBQ, covered gazebo with seating and patio area for sunbathing. A gate from the rear garden is provided to steps leading down to the sandy beach. Mirage sleeps a maximum of 12 persons. 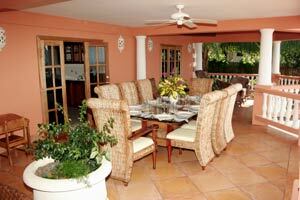 The two smaller villas, Bougainvillea & Hibiscus are identical and are both fully furnished. Each villa sleeps maximum 8 persons and the description below applies to both villas..
An entrance hall provides immediate access into the lounge/dining room areas and open plan kitchen together with 2 bedrooms, cloakroom and stairs to first floor. The ground floor bedrooms comprise of one twin room and one double room. The kitchens are fully equipped as per Mirage above. On the first floor there are 2 bedrooms; one double, one twin; both en-suite and with a lounge area between them. Access from both bedrooms and the lounge is provided to the large balcony area. 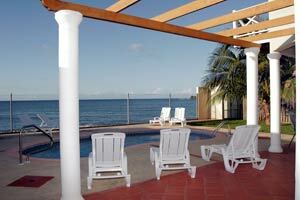 On the balcony there is a further lounge in the form of a gazebo which is furnished with seating. The rear garden area has its own pool, patio and BBQ. Although these 2 villas look out over the sea, steps are not provided to the beach and access is gained to the beach via the side road. 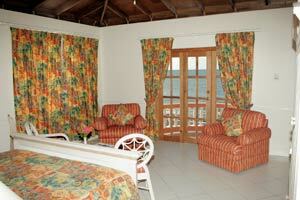 All villas above are provided with towels, beach towels & linen. Mirage is provided with toweling dressing gowns. All villas are fully air- conditioned and provided with ceiling fans. Mirage is provided with a safe in each bedroom. Weddings and other celebrations can be held at Mirage with guests staying at all 3 villas if required. A maximum 28 guests can be accommodated for sleeping basis and maximum 60 for any one day celebration at Mirage. 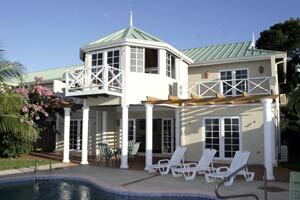 A villa hire charge is payable when a celebration is to be at Mirage. Catering, cake, flowers, minister, license, music, photographer, videographer etc can be arranged at cost direct to the client. A minimum stay of 7 days is required for wedding or other party celebrations. Catering arranged by client should include for hire of tables, cutlery, crockery, napery etc. Please specify the number of rooms needed and the type of villa. We’ll get back you with your rate.